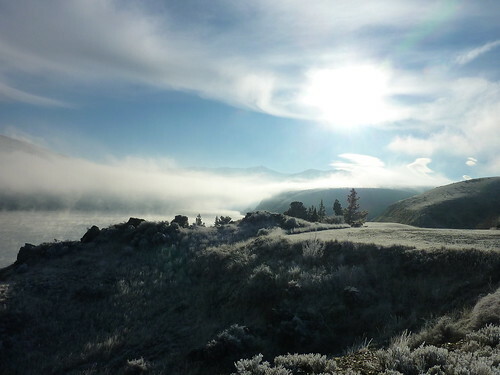 The weather took a frosty turn in the morning. 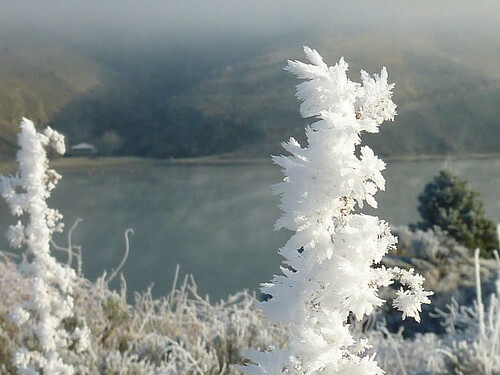 It wasn't the coldest we'd been, but NZ was reminding us that winter was indeed coming. 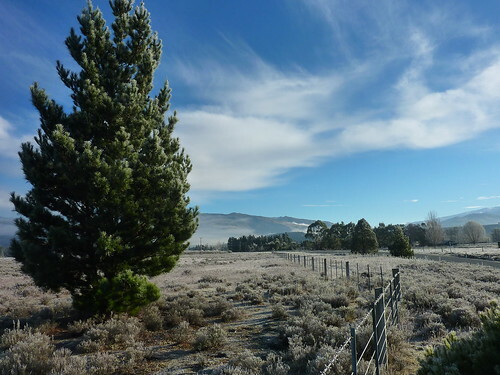 As you can tell, the stops along the way allowed us to take some suitably chilly shots, and it seemed that around every corner there was another beautiful winter vista ahead of us. 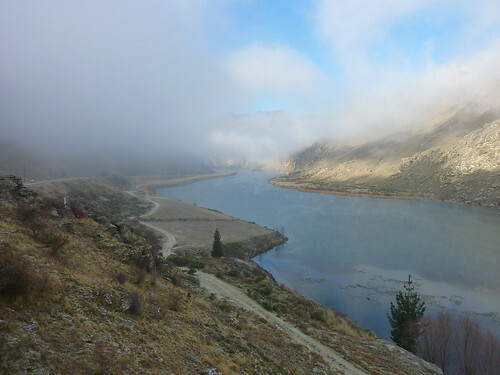 We travelled over a pass high above the town of Clyde which had been built up around the gold rush of the 1860s, and saw huge snow clouds making their way across the neighbouring town of Cromwell. Around another bend was a stop-off for Roaring Meg, a stream who was named after a saloon lady being accompanied (along with her companion) by gold diggers. Upon seeing their paths blocked by water, the gentlemen carried the ladies across. Meg made so much fuss and noise that the diggers named the stream Roaring Meg after her. The other lady was so quiet that the diggers named the next stream they came to Gentle Annie. 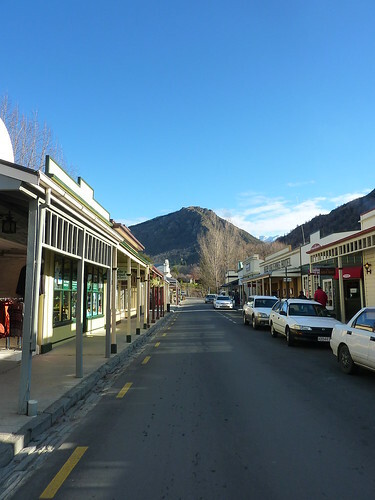 Arrowtown is accessible off the main road to Queenstown; it's a small place with one main shopping street, a few places to eat and a museum. It has an "Old West" feel about it but I wouldn't recommend taking a special trip to see the place. 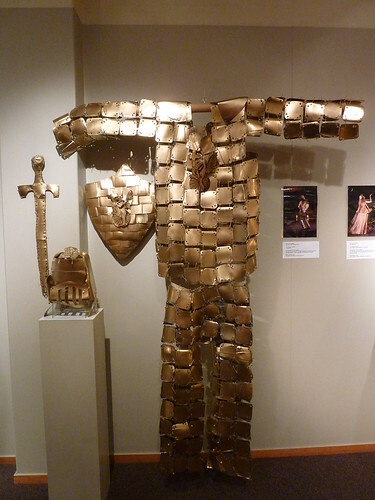 We had a look around the museum which was hosting a "fashion collection" of clothes created from recycled materials. The creativity that went into some of the outfits was superb. 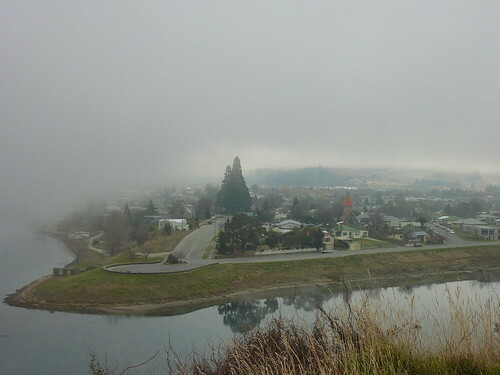 Our main destination was Te Anau, a town which boasts the second biggest lake in NZ. 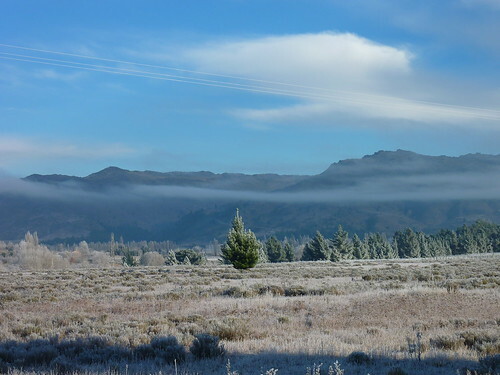 That wasn't the reason for coming though: Te Anau is also the gateway to both Milford Sound and Doubtful Sound which are high on the list of attractions for visitors to the country. There are pros and cons of visiting both. 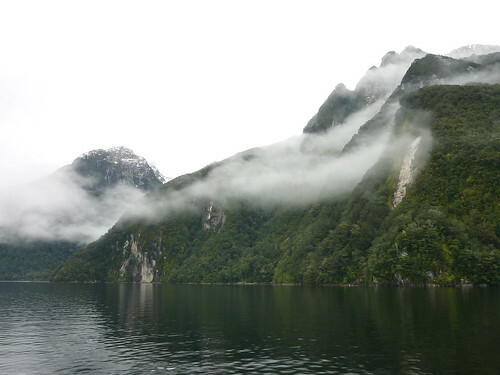 Milford Sound is the most accessible and consequently the busiest, with multiple tour operators plying the waters year-round and offering short trips with reasonable rates. 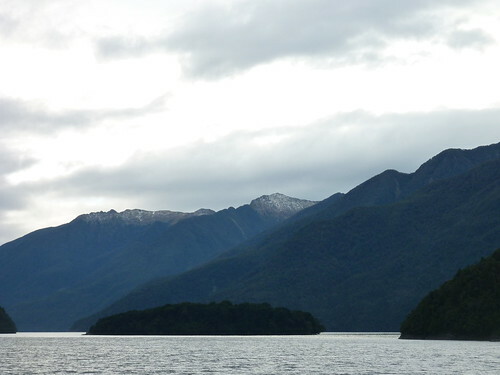 Doubtful Sound had only one operator when we arrived in Te Anau, as the other was servicing its boat over winter. The price was over double that of Milford, but offered a much longer trip with a guarantee that we would be the only tour boat on the water. 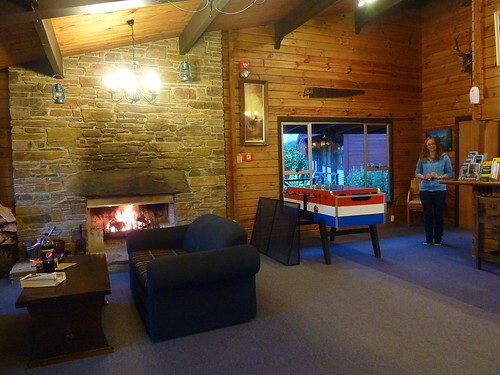 We opted for Doubtful Sound after some thought, and booked into the excellent Great Lakes Holiday Park for the evening which had a roaring fire and a log cabin lodge to eat and relax in. 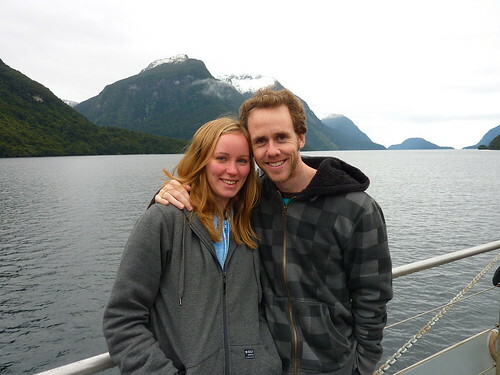 The night wasn't too cold, which we were thankful for as an early start awaited us for the trip to Doubtful Sound the next morning. 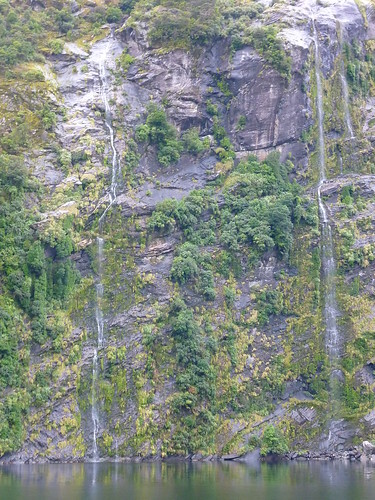 Fun fact:- neither Doubtful Sound nor Milford Sound are actually sounds (inlets carved out by seawater flooding a river valley). 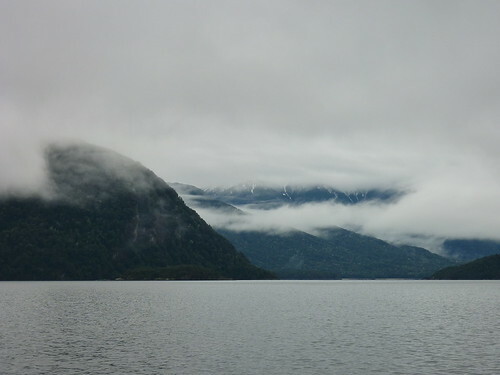 They are actually fjords (inlets carved out by glaciers), but the terms seem to be used interchangeably. 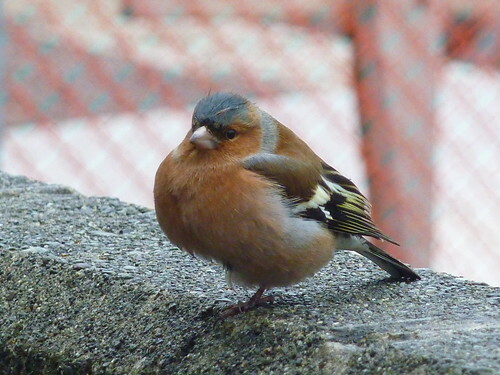 We boarded the Real Journeys boat and were bid farewell by this chap, who really needs to cut down on the pies. The mist was rolling in over the cliffs as we departed. 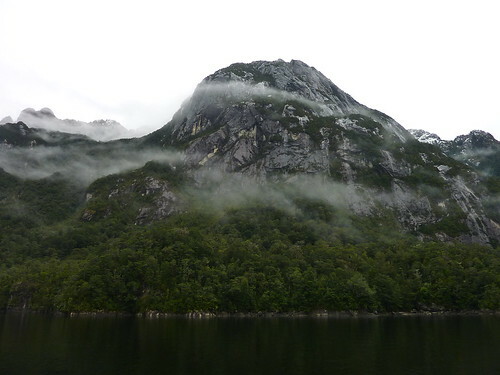 We weren't heading straight to the fiord, as we had a stop-off at a power station first. 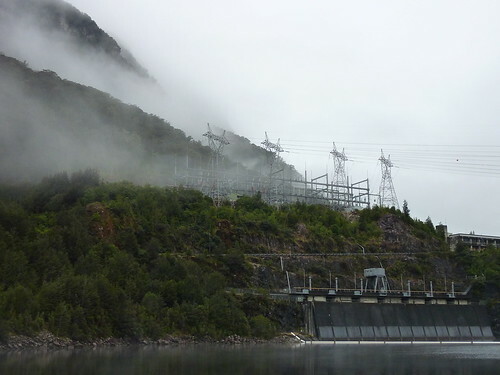 Manapouri Power Station was built in 1971 and had its share of controversy. 16 people died in its construction; it was built the hard way, with drills and explosives rather than the huge boring machines available to miners today. 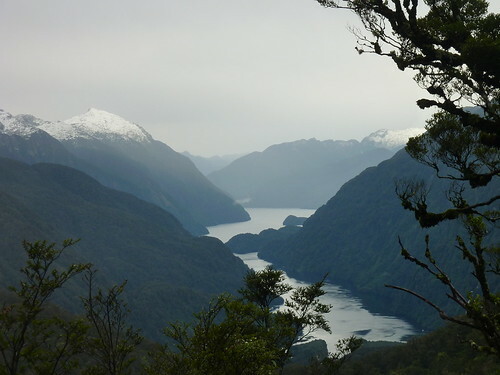 The government wanted to raise Lake Manapouri by 30 metres which would have flooded the islands of Manapouri, and it caused widespread protest from over a quarter of a million New Zealanders who were concerned about the environmental impact (the country's population is only 4.4 million). 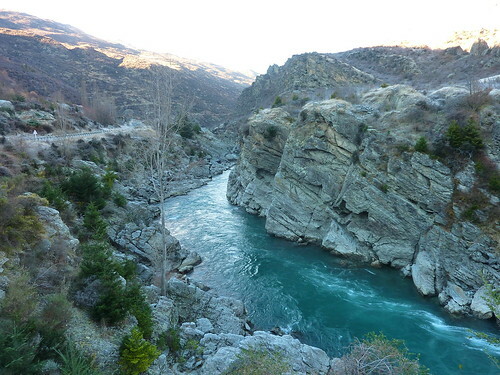 They won the battle, and the government agreed not to raise the lake level. 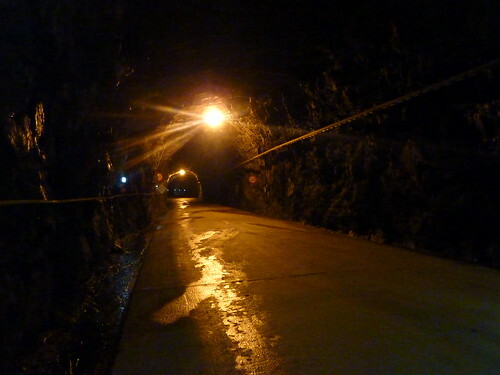 After getting off the boat (the only way to get to the power station for anyone, including the workers) we drove into a long tunnel which took us deep underground to the heart of the power station. 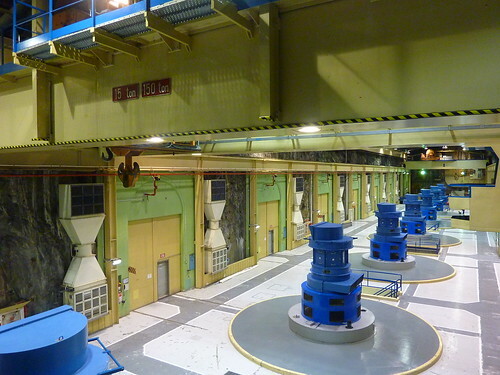 We could only look down onto the machine hall, so the visit was fairly short and we were soon back on the boat and heading out onto the water. 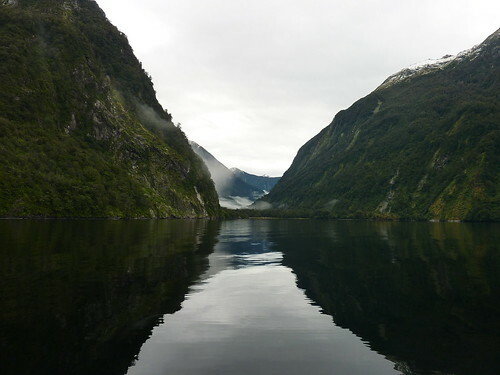 The fjord was named originally named Doubtful Harbour when Captain Cook sailed past in 1770 - he refused to enter the inlet as he didn't believe it to be navigable. 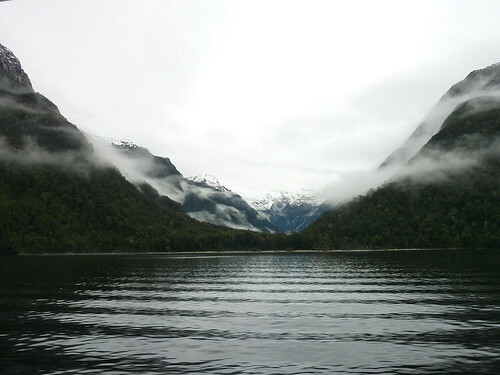 We got in a bus and took the Wilmot Pass down a very steep road (1 : 6) to the water, but not before we got a glimpse of Doubtful Sound from a viewpoint which is normally fogged over. 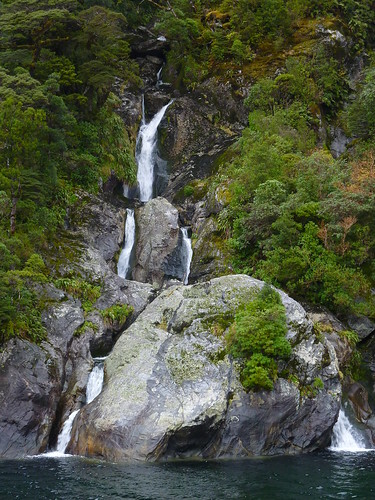 In the spring and autumn months, both Milford and Doubtful Sound are a lot busier as the weather is nicer and the waterfalls are much more powerful. 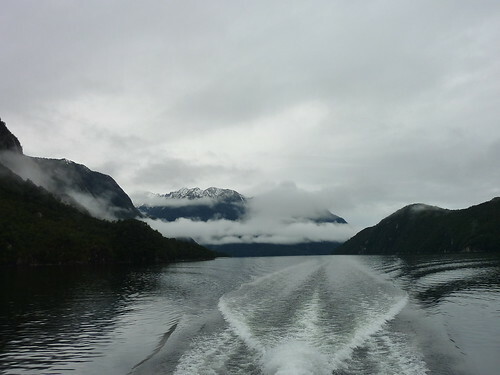 We'd been given overcast skies, but the misty surroundings and quiet waters made the experience ethereal, especially when we reached the halfway point and the captain turned off the engine and asked us all to remain as silent as possible for three minutes to just soak in the atmosphere. 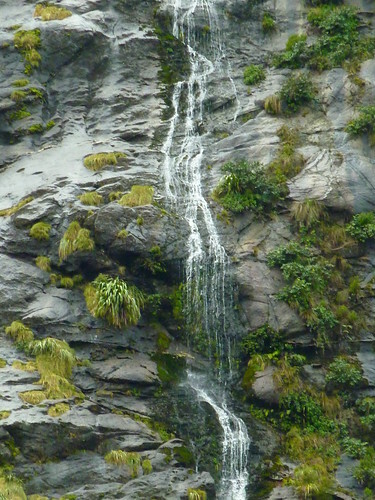 There is a noticeable lack of birdsong on Doubtful Sound, which is due to the introduction of various pests such as stoats to the surrounding habitat. Locals are encouraged to shoot on sight, and the birds are slowly beginning to return to the area, but it will be some time before their numbers are healthy. We were hoping to see dolphins and seals on the trip but other than a brief flash of grey in the water about 100m to the side of us at one point, we didn't spot anything. 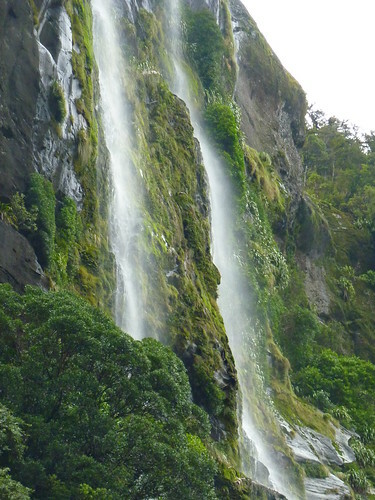 Nevertheless, it was a fun trip, and I was glad we took the less-trodden path and went to Doubtful rather than Milford as it gave us more time on the water to enjoy the scenery. 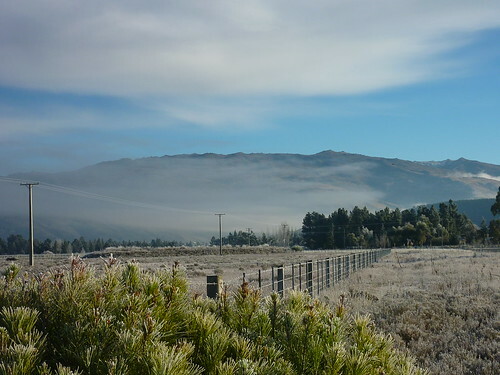 We spent another night at the Great Lakes Holiday Park and moved on in the morning - our route was taking us back the way we came but this time we were going to Queenstown: the activity centre of NZ the South Island. 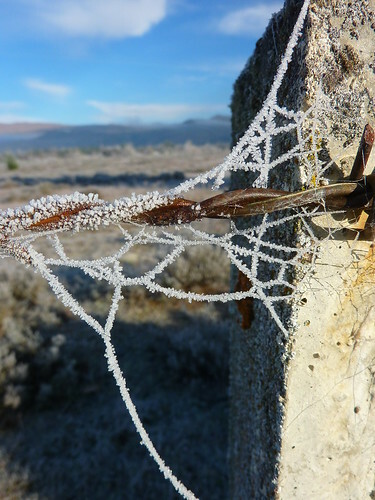 Beautiful pics in this blog! Looking forward to seeing you guys soon!